The AOM-CTGS-i2TM is the latest MicroLP 2-port 10GBase-T controller for our compact and high density servers. With compact design and lower power consumption, it can fit in small spaces while providing the highest networking bandwidth for data centers. It is packed with management features such as Asset Management and NC-SI which allow customers to monitor the servers remotely as well as the health of the card itself. Based on the latest Intel®X550 controller, it is an excellent choice for customers who are looking to expand their network connectivity with highest bandwidth. 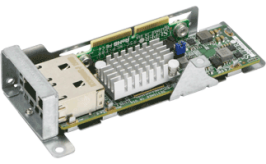 The AOM-CTGS-i2TM comes pre-assembled with a riser card and bracket, and is designed in a small microLP form factor to fit Supermicro 12 node MicroCloud server systems.